After the Y9 2019, Huawei has some big plans with the Y7 2019! After the massive success of the Huawei Y9 2019, Huawei has now launched the Y7 2019 in Pakistan. The phone has a host of superb features and specs at a great price. With the Huawei Y7 2019, you can get a lot a premium looking phone with a dewdrop notch, a 6.26″ display and more! Why is the Huawei Y7 2019 a big deal? With the launch of the Huawei Y9 2019, the smartphone giant had some stellar sales and reception of the phone in Pakistan. The Y9 delivered a host of premium features in a pocket-friendly price. The Huawei Y7 2019 is poised to strike gold twice. The Huawei Y7 comes with Face Unlock, a 4000 mAh Battery, superb cameras and a large display. All of this at an attractive price of 28,499/- PKR. The phone is targeted towards the youth as it offers an elegant design, Huawei’s proprietary 6.26-inch FullView display with a dewdrop notch for maximum screen-to-body ratio. This helps deliver a phone with a FHD+ resolution and a brilliant mix of colors. The phone has a triple camera setup (2 at the back and 1 at the front), with the 16 MP Selfie camera and a dual 13 MP + 2 MP rear camera that has AI Photography. The selfie camera also helps with giving the phone Face Unlock capability, so that you have an additional layer of security included to go with the fingerprint sensor on the phone. To help power all these features, the phone has a massive 4,000 mAh Battery. Packed in with the Qualcomm Snapdragon 450 SoC aired with the Adreno 506 GPU. The most unique thing about the SoC is Vulkan support for better gaming. The base model of the phone has 3GB of RAM paired with 32GB of internal storage with expansion up to 512GB via MicroSD Card. 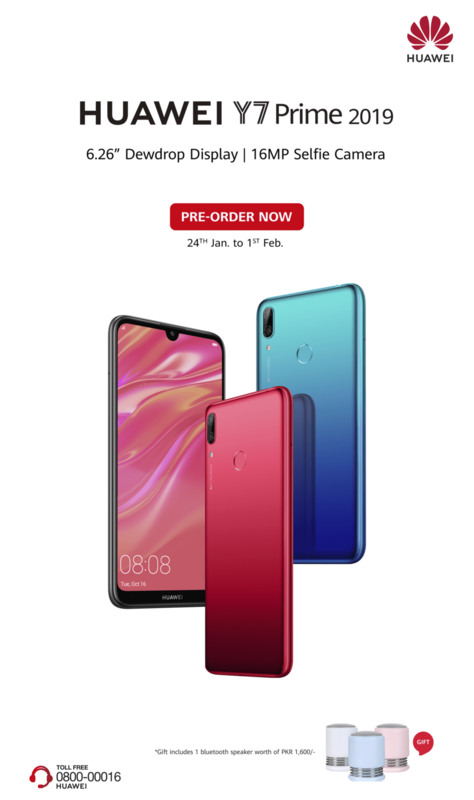 You can pre-order the phone starting Thursday, 24 January – Friday, 01 February, 2019 and pre-order customers stand to win a special prize from the company when pre-orders end.